Help keep your car in pristine condition with Solvit's Waterproof SUV Cargo Liner. This liner is made from a heavy-duty polyester material for longevity. And its fully waterproof backing provides extra protection from dirt, dander, and accidental "spills". It's also designed with multiple hook and loop fasteners on the underside to help keep the liner in place during the ride. Best of all, it's machine washable for an easy, hassle-free clean! 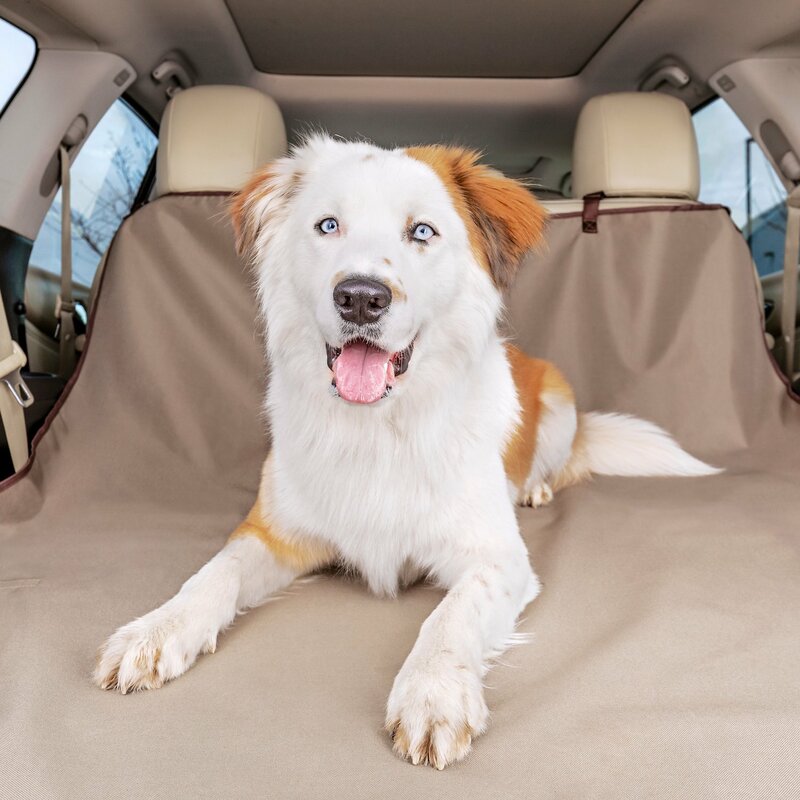 Designed with a waterproof backing to help protect your car from your pet's accidents. Made from durable heavy-gauge polyester to save your seats from dirt, dander and anything that could cause stains or rips. Multiple elastic straps and a Sta-Put device keep the cover firmly in place in all vehicles with headrests. Machine washable fabric allows for easy cleaning. Designed with Solvit's SmartFit feature for an improved fit for most vehicles. Always make sure the floor of the vehicle is dry before installing the Solvit SUV Cargo Liner. The SUV Cargo Liner is designed to lay flat in the cargo area of the largest model SUV’s with the rear bench removed. The front edge of the cargo liner has straps to go around the headrests of the middle bench row, if desired. There are strips of hook tape sewn to the back of the liner. The hook tape grips to most common types of automotive carpet and will help keep the cover in place. To clean, promptly wipe up any foreign matter or standing liquid with a damp cloth or sponge. Machine wash the cover in a commercial size front loading washing machine. Use cold water with a mild detergent. Line dry. This is exactly what I was looking for. I take my dogs hiking and they always seem to find the water! This is what I needed to keep my car free of paw prints of water and mud! Easy to take in and out of car to clean!!! Just what we were looking for so our pups don't fall between seats. I got this to cover the cargo, third row seats and half the 2nd row that is folded down in my SUV. This covers the whole length and is water proof. However, the stay put option is adhering Velcro to the vehicle. Not ideal. But this covers all the cracks between seats where dirt and fur go which was my main reason for the purchase. Feels like a quality product. Solvit Waterproof Sta-Put SUV Cargo Liner, this is a great product ! Thanks ! Although this is advertised for pets, I'm using it to protect my interior when I transport my bike inside my car! Instead of a rubber mat, this can be folded up when not in use! I have only used this product for about a week now, but it is doing everything it advertised and was very easy to install. A color choice would have been nicer though. This liner is exactly what I needed for my non stop shedding lab. It's also very thick material so she hasn't tried to chew it! It's a little long in the back of my JGC but I just fold the excess under and it's a perfect fit.